La plupart des dents surnuméraires se situent dans la région maxillaire antérieure. Elles sont classifiées suivant leur forme et leur emplacement. Leur présence peut causer une variété de problèmes cliniques. Pour mieux les déceler, il est préférable deffectuer un examen clinique et radiographique complet. Leur traitement devrait faire partie dun plan de traitement global. Le présent article offre un aperçu des problèmes cliniques associés aux dents surnuméraires et aborde les questions de classification, de diagnostic et de traitement de cette entité clinique difficile. Supernumerary teeth may be encountered by the general dental practitioner as a chance finding on a radiograph or as the cause of an impacted central incisor. They may also be found intraorally following spontaneous eruption. The most common supernumerary tooth which appears in the maxillary midline is called a mesiodens. Treatment depends on the type and position of the supernumerary tooth and on its effect on adjacent teeth. A supernumerary tooth is one that is additional to the normal series and can be found in almost any region of the dental arch. The etiology of supernumerary teeth is not completely understood. Various theories exist for the different types of supernumerary. One theory suggests that the supernumerary tooth is created as a result of a dichotomy of the tooth bud.1 Another theory, well supported in the literature, is the hyperactivity theory, which suggests that supernumeraries are formed as a result of local, independent, conditioned hyperactivity of the dental lamina.1,2 Heredity may also play a role in the occurrence of this anomaly, as supernumeraries are more common in the relatives of affected children than in the general population. However, the anomaly does not follow a simple Mendelian pattern. 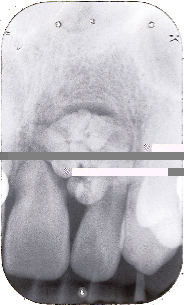 Figure 2: Occlusal radiograph showing inverted and conical mesiodens. Figure 3: Paired tuberculate supernumeraries with associated eruption disturbances. 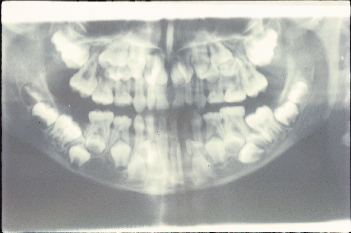 Figure 4: Failure of eruption of maxillary central incisors associated with the paired tuberculate supernumeraries illustrated in Fig. 3.
supplemental tooth is the permanent maxillary lateral incisor, but supplemental premolars and molars also occur. The majority of supernumeraries found in the primary dentition are of the supplemental type and seldom remain impacted. 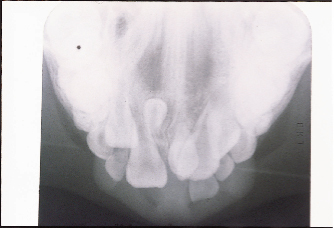 Figure 5: Supplemental mandibular premolars with follicular enlargement. Howard lists odontoma as the fourth category of supernumerary tooth.11 However, this category is not universally accepted. The term odontoma refers to any tumor of odontogenic origin. Most authorities, however, accept the view that the odontoma represents a hamartomatous malformation rather than a neoplasm. The lesion is composed of more than one type of tissue and consequently has been called a composite odontoma.12 Two separate types have been described: the diffuse mass of dental tissue which is totally disorganized is known as a complex composite odontoma (Fig. 6), whereas the malformation which bears some superficial anatomical similarity to a normal tooth is referred to as a compound composite odontoma. 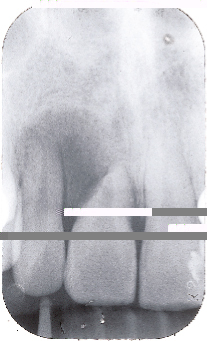 Figure 6: Periapical radiograph of complex composite odontoma. The presence of a supernumerary tooth is the most common cause for the failure of eruption of a maxillary central incisor. It may also cause retention of the primary incisor. The problem is usually noticed with the eruption of the maxillary lateral incisors together with the failure of eruption of one or both central incisors (Figs. 3 and 4). Supernumerary teeth in other locations may also cause failure of eruption of adjacent teeth. 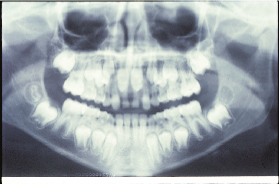 Erupted supplemental teeth most often cause crowding. A supplemental lateral incisor may cause crowding in the upper anterior region. The problem may be resolved by extracting the most displaced or deformed tooth. Figure 7: Dentigerous cyst associated with mesiodens. Figure 8: Resorption of the roots of the maxillary central and lateral incisor caused by complex composite odontome illustrated in Fig. 6. Supernumerary teeth may compromise secondary alveolar bone grafting in patients with cleft lip and palate. Erupted supernumeraries are usually removed and the socket site allowed to heal prior to bone grafting. Supernumeraries should not be extracted without consultation with the cleft team. Cooperation between the general dental practitioner and the cleft team is essential. Unerupted supernumeraries in the cleft site are generally removed at the time of bone grafting. The presence of an unerupted supernumerary in a potential implant site may compromise implant placement. The supernumerary may require removal prior to implant placement. If removed at the time of implant placement, bone grafting may be required. Occasionally, supernumerary teeth are not associated with any adverse effects and may be detected as a chance finding during radiographic examination. A radiographic examination is indicated if abnormal clinical signs are found. An anterior occlusal or periapical radiograph is useful to show the incisor region in detail. The bucco-lingual position of unerupted supernumeraries can be determined using the parallax radiographic principle:16 the horizontal tube shift method utilizes two periapical radiographs taken with different horizontal tube positions, whereas an occlusal film together with a panorex view are routinely used for vertical parallax. If the supernumerary moves in the same direction as the tube shift it lies in a palatal position, but if it moves in the opposite direction then it lies buccally. Intraoral views may give a misleading impression of the depth of the tooth. A true lateral radiograph of the incisor region assists in locating the supernumeraries that are lying deeply in the palate and enables the practitioner to decide whether a buccal rather than a palatal approach should be used to remove them. Treatment depends on the type and position of the supernumerary tooth and on its effect or potential effect on adjacent teeth. The management of a supernumerary tooth should form part of a comprehensive treatment plan and should not be considered in isolation.  spontaneous eruption of the supernumerary has occurred.  removal would prejudice the vitality of the related teeth.  the space available within the arch for the unerupted tooth. Removal of a supernumerary tooth preventing permanent tooth eruption usually results in the eruption of the tooth, provided adequate space is available in the arch to accommodate it.18 Di Biase found 75% of incisors erupted spontaneously after removal of the supernumerary.17 Eruption occurred on average within 18 months, provided that the incisor was not too far displaced and that sufficient space was available. If there is adequate space in the arch for the unerupted incisor following supernumerary removal, space maintenance can be ensured by fitting a simple removable appliance. If the space is inadequate, the adjacent teeth will need to be moved distally to create space for incisor eruption. In that case, the primary canines may need to be extracted at the same time as the supernumerary tooth. Where there is adequate space and the incisor tooth fails to erupt, surgical exposure of the incisor and orthodontic traction is usually required. Dr. Garvey is senior lecturer/consultant in orthodontics, department of public and child dental health, Dublin Dental Hospital, Ireland. Dr. Barry is senior lecturer/consultant in oral surgery, department of oral surgery, oral medicine and oral pathology, Dublin Dental Hospital, Ireland. Dr. Blake is lecturer/consultant in orthodontics, department of public and child dental health, Dublin Dental Hospital, Ireland. Reprint requests to: Dr. M. Thérèse Garvey, Department of Public and Child Dental Health, Dublin Dental Hospital, Lincoln Place, Dublin 2, Ireland. 1. Liu JF. Characteristics of premaxillary supernumerary teeth: a survey of 112 cases. ASDC J Dent Child 1995; 62:262-5. 2. Levine N. The clinical management of supernumerary teeth. J Can Dent Assoc 1961; 28:297-303. 3. Brook AH. Dental anomalies of number, form and size: their prevalence in British schoolchildren. J Int Assoc Dent Child 1974; 5:37-53. 4. Scheiner MA, Sampson WJ. 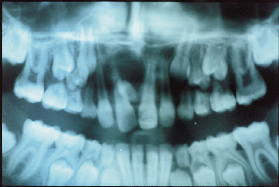 Supernumerary teeth: a review of the literature and four case reports. Aust Dent J 1997; 42:160-5. 5. Vichi M, Franchi L. Abnormalities of the maxillary incisors in children with cleft lip and palate. ADSC J Dent Child 1995; 62:412-7. 6. Jensen BL, Kreiborg S. Development of the dentition in cleidocranial dysplasia. J Oral Pathol Med 1990; 19:89-93. 7. Kinirons MJ. Unerupted premaxillary supernumerary teeth. A study of their occurrence in males and females. Br Dent J 1982; 153:110. 8. Mitchell L. An Introduction to Orthodontics. 1st ed. Oxford University Press; 1996. p. 23-5. 9. Andlaw RJ, Rock WP. A Manual of Paediatric Dentistry. 4th ed. New York: Churchill Livingstone; 1996. p. 156. 10. Foster TD, Taylor GS. Characteristics of supernumerary teeth in the upper central incisor region. Dent Pract Dent Rec 1969; 20:8-12. 11. Howard RD. The unerupted incisor. A study of the postoperative eruptive history of incisors delayed in their eruption by supernumerary teeth. Dent Pract Dent Rec 1967; 17:332-41. 12. Shafer WG, Hine MK, Levy BM. A Textbook of Oral Pathology. 4th ed. Philadelphia: W.B. Saunders; 1983. p. 308-11. 13. Awang MN, Siar CH. Dentigerous cyst due to mesiodens: report of two cases. J Ir Dent Assoc 1989; 35:117-8. 14. Primosch RE. Anterior supernumerary teeth  assessment and surgical intervention in children. Pediatr Dent 1981; 3:204-15. 15. Hogstrom A, Andersson L. Complications related to surgical removal of anterior supernumerary teeth in children. ASDC J Dent Child 1987; 54:341-3. 16. Houston WJB, Stephens CD, Tulley WJ. A Textbook of Orthodontics. 2nd ed. Wright Publications; 1992. p. 174-5. 17. Di Biase DD. The effects of variations in tooth morphology and position on eruption. Dent Pract Dent Rec 1971; 22:95-108. 18. Mitchell L, Bennett TG. Supernumerary teeth causing delayed eruption  a retrospective study. Br J Orthod 1992; 19:41-6. 19. Witsenburg B, Boering G. Eruption of impacted permanent upper incisors after removal of supernumerary teeth. Int J Oral Surg 1981; 10:423-31.